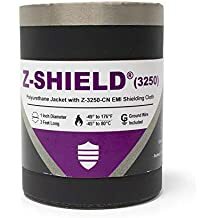 Hook N Shield Tpu - Hook N Shield - Trade Names - ZT | Zippertubing Co. The Hook-N-Shield® family of products are an EMI/RFI sheilding, toolless, field-installable, re-enterable jacketing system that is perfect for any installation where frequent accessibility is required. Utilizing a hook-and-loop closure, these convenient, easy-to-use products provide you a simpler way to protect and shield your wires or cables. Hook-N-Shield® is available in a variety of hook-and-loop closure options, as well as various diameters, jacketing materials, and shielding alternatives. An EMI shielded, white, halogen-free, flame-retardant, thermoplastic polyurethane hook-and-loop solution. 0.5" 0.625" 0.75" 0.875" 1.0" 1.125" 1.25" 1.375" 1.5" 1.625" 1.75" 1.875" 2.0" 2.125" 2.25" 2.375" 2.5" 2.625" 2.75" 2.875" 3.0" 3.125" 3.25" 3.375" 3.5" 3.625" 3.75" 3.875" 4.0" 4.25" 4.5" 4.75" 5.0" 5.25" 5.5" 5.75" 6.0"
Zippertubing® offers two types of fully halogen-free EMI shielding with the Hook-N-Shield® (TPU) solution, which includes our SHX mesh and our Z-7200-C cloth. Hook-N-Shield® (TPU) provides one of the best ways to obtain a clean, white appearance on the outside while offering a hook-and-loop closure and EMI shielding on the inside. EMI shielding is important for many applications, but this particular solution is not just an EMI shielding solution; it also offers halogen-free and flame-retardant properties. 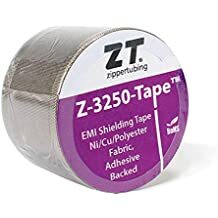 Zippertubing® offers two types of fully halogen-free EMI shielding with the Hook-N-Shield® (TPU) solution, which includes our SHX mesh and our Z-7200-C cloth. Z-7200-C offers superior EMI shielding, while the SHX mesh provides a durable and conductive EMI shielding layer. Because of the way that this product is engineered, it’s also a great solution for applications in which higher-temperature environments are likely to impact cables or wires. Although this Hook-N-Shield® (TPU) is not specifically manufactured using a clean room in sterile conditions, with the right procedures, it could be used in the medical field, including in hospitals, operating rooms, trauma centers, and emergency rooms. Fits cable diameters of 0.5" to 6"
Cable Diameter 0.5" 0.625" 0.75" 0.875" 1.0" 1.125" 1.25" 1.375" 1.5" 1.625" 1.75" 1.875" 2.0" 2.125" 2.25" 2.375" 2.5" 2.625" 2.75" 2.875" 3.0" 3.125" 3.25" 3.375" 3.5" 3.625" 3.75" 3.875" 4.0" 4.25" 4.5" 4.75" 5.0" 5.25" 5.5" 5.75" 6.0"